Home Columnists Not co-production: Was your child’s Education, Health and Care plan outsourced? Matt: Does your child have an EHCP? Are they in the process of getting one? 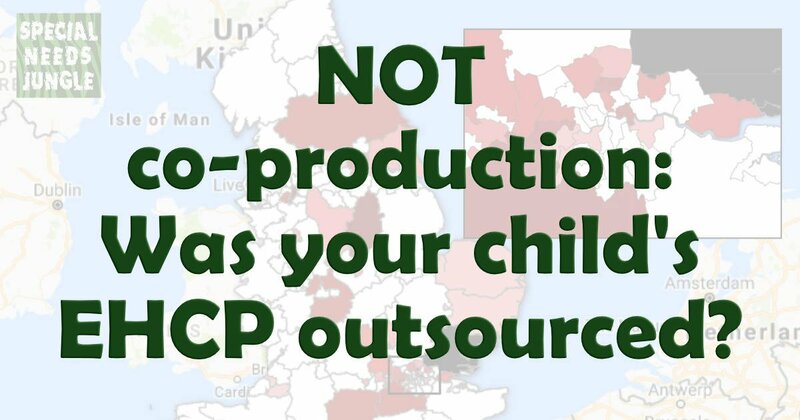 Then there’s a good chance that your child’s EHCP hasn’t been put together by your local authority SEN officer – but by a freelancer working for an outsourcing company. The company sends the draft EHCP report back to the LA, who review it and send it out to parents. As a parent, all you see is the EHCP draft from the LA. It’s near-impossible to tell whether or not someone outside the LA has put your child’s EHCP together. So how much is this happening? I’ve been digging into the scale and scope of these outsourcing operations. There are several private companies out there actively marketing EHCP document writing services to LAs. And a surprisingly large number of LAs are using them. From the data I’ve looked at, at least 42 of England’s 152 local authorities have paid money to one of these EHCP writing firms since April 2015. Some LAs use them on a large scale, particularly in London, the South, and the metropolitan North and Midlands. Together, these 42 LAs have procured at least £1.6 million of services from EHCP writing firms – and business is booming. Tracked spend for the last financial quarter is already 20% up on last year’s average. It’s hard to tell how many EHCPs are being outsourced nationally – but one firm claims to be processing 1200 EHCPs per month. If that’s a sustained rate, then right now around 1 in 4 EHCPs is being handled this way. For a full breakdown of each LA that we have published figures, click here. The Department for Education’s data points to an obvious reason: LAs are struggling hugely with the EHCP process. LAs produced fewer than 60% of new EHCPs within statutory timescales last year, and many LAs are doing much worse. And a bow-wave is developing: LAs also still have to convert over 200,000 statements of special educational need and Learning Difficulty Assessments into EHCPs. They have to do this by April 2018, and they are massively behind schedule. LAs have a big capacity problem. It is likely that many are turning to outsourcers to solve it. Outsourcing seems to go against the basic philosophy of the SEND reforms. How can an EHCP be person-centred, when the person producing it has never met the child, will never meet the child, and lives hundreds of miles away from the child? But philosophy doesn’t get the job done. There is nothing inherently illegal about outsourcing EHCP drafting – whether it’s outsourced or not, the LA still has legal responsibility for the EHCP and its content. And with LAs struggling, in principle this could be a way to relieve pressure on the system. What matters above all is this – are the EHCPs that get produced this way timely, high-quality and lawful documents? Right now, we can’t tell - and there are many questions here that need answers. Timeliness: Boosting LA capacity through outsourcing should (in theory) result in more EHCPs being turned around on time – arguably a good thing. However, it’s hard to see evidence of improved timeliness in the DfE data. There are several LAs outsourcing on a large scale who are still nowhere near getting even a fraction of their EHCPs done on time. Quality: There’s no reason - in theory - why outsourcers would be any worse at producing quality EHCPs than in-house LA staff. A lot depends though on what service level the LA demands, how well-trained the freelancers are in SEND process and law, and how the outsourcer’s business model works. All of that is hidden. What little data there is out there gives cause for concern. The aggregate data I’ve seen suggests that LAs are paying in the region of £55-60 per EHCP. The freelancer producing the EHCP draft will only see a percentage of that. Realistically, if the freelancer wants to pull in more than the minimum wage for an EHCP, they’ll have to knock them out at a rate of more than one per day. Think about that, and about what it takes to put a single EHCP together properly. Reading & analysing specialist professional reports, crafting outcomes, accurately capturing the views and wishes of the child, drafting the entire document in the template, and – crucially - checking its compliance with SEND legislation and the Code of Practice. All of that has to be done in just a few hours, if it’s going to pay better than a shift at KFC. And there is a clear hazard here. If freelancers are paid per EHCP, then the quicker they get them done, the more they get paid for a given period of time on the job. That’s not a recipe for quality – particularly if the LA customer is not fussed about quality lawful content either. Data Protection: Wherever they work, and whoever they work for, people who produce EHCPs have to handle large quantities of confidential personal data about a child. There are strict legal requirements that professionals handling, storing and communicating this data have to follow – and they almost always have to seek parental consent to share this data with third parties. From here, we simply have no idea how LAs ensure data protection when they outsource. It is entirely possible that measures in place are robust. But this is a working model riven with potential for data protection failure. We now know that many LAs are outsourcing EHCP production to private companies, some on a large scale. There are potential pros as well as cons to this approach. Outsourcing is not inherently a bad thing. However, the bottom line still isn’t clear: are outsourced EHCPs, timely, high-quality and lawful? That’s where we need your help. Parents: Do you know whether your young person’s EHCP draft has been put together in-house, or by an outsourcing firm? Have you noticed any change – positive or negative - in the quality, lawfulness or timeliness of EHCPs? Did your LA seek – and receive – your consent before sending your child’s personal data on to a third party? Local professionals: Does your LA use an EHCP outsourcing firm? Are you satisfied with the quality and lawfulness of the draft EHCP reports you have seen from these firms? Are you satisfied that data protection remains robust, both in transit and at rest? Is this arrangement making a positive difference to your working life, and to the support you give to young people with SEND? I imagine a great deal of the work is in conversions. One firm offers to convert statements to the EHCP format and advises how to set out the transfer review paperwork for the statement, so the LA is even less involved. Hi Fiona – I suspect you’re right – however, most of the work seems to be parcelled out to these firms on a piecemeal basis by LAs. 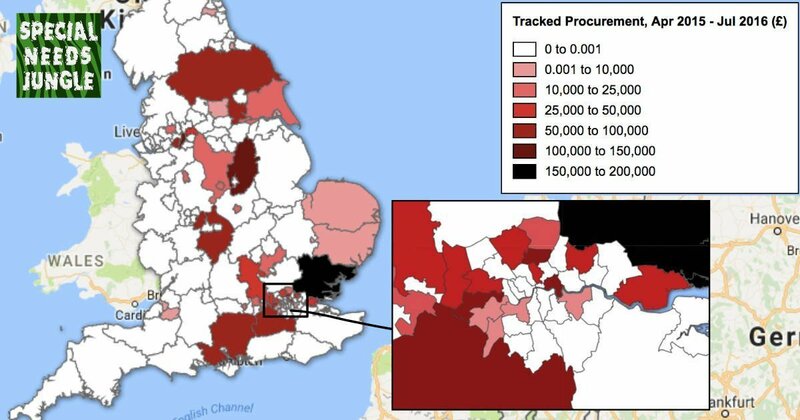 I’ve only found evidence of two long-term EHCP conversion contracts – Notts & North Yorkshire. The payments made by other LAs are highly variable month-by-month – I doubt that many of them are doing all their conversion backlog under a fixed-term arrangement right now. I cannot see how this fit plus – has anyone been told explicitly that their plan is being outsouced? Hi bren – it does feel like a business arrangement that needs closer legal scrutiny, and I think it should also be serious line of enquiry for Ofsted / CQC inspectors – particularly the 9.34 & DPA points. With 9.53, I guess it depends how generous an interpretation you take of the duty to “prepare.” As far as I can tell, the LA still holds both ends of the EHCP preparation process, it’s the middle part that some are farming out. So far, I’ve yet to hear of a parent who knows that their child’s plan has been put together by a third party. This is exactly the type of article that should be in the public domain. The ‘bible’ (EHCP) for professionals to read about our children should not be outsourced. Whether a child/young person is on the new system or old system, I doubt very much that it will make any difference in their lives or their parents lives for the foreseeable future.The deadlines are ridiculous and lend themselves to the antiquated nature of public sector provision; ‘make sure the boxes are ticked and then we might have a look at how bad things really are’. I could right for an hour on this subject but the key factor for me is that we are trying to change a system that is broken and yet again we are ‘building on sand’. I have child in mainstream that is typically developing and child in specialist provision that has severe autism, if parents of typically developing children experienced 5% of the social injustices that are bestowed on SEND families the whole country would be in uproar. This is an excellent article and an area that all SEND families should be concerned about. Lets not allow the semi retired, non current, ex LA worker be able to generate thousands of pounds via a make-shift consultancy firm because they are perceived to be the only ‘port in the SEND storm’. Your right the article is excellent and the key issue is the lack of transparency by LA’s which as you state this article needs sharing as until now out the outsourcing of the writing of ECH Plans by some LA’s was not being spoken about. Thanks, canis, that’s appreciated. Personally, I wouldn’t want my child’s EHCP to be produced this way; my children will be having their statements converted to EHCPs soon, and my LA is one of the 42 listed above – in fact, my LA is using the DfE’s SEND reform grant money to fund this work. There are big pitfalls with this way of doing things. But ultimately, whether the EHCP is produced in-house or by a third party, what counts above everything is what service level the LA demands across the process. Even if you were to get a brilliant freelancer, they won’t produce a good EHCP if the professional advice isn’t specified or quantified properly. And the LAs’s service level agreement – as with so much in SEND – will remain opaque. This article raises a number of issues, some legal, some moral and some of which are just the down right practical. One of the key considerations under the SEND legislation including data protection, is who has access to the information, how is it stored and retrieved and who is accountable. Are the reports produced accurate and timely? The procurement process should have covered all the issues to do with data access rights and storage but be warned external data handling may not be as robust as the local authority think their processes are on their own system. Key question – Either at review or prior to it is to the SEN officer who turns up is who collates these reports and the data and are they in house or outsourced? Ask what format is the data accessed in if it is outsourced and how it is being protected from third parties who shouldn’t see it. Once you have these answers if you are not happy you can always go to the local authority information governance officer or the information commissioners office. Obviously there are a lot more legal issues than this but it gives you something to think about. Moral Issue – to outsource or not. If it gets the job done on time and the ECH Plan reflects what was written and discussed at the review by those professionals who know your child and enables your child to move forward then this really is an issue of conscience. One point made in the article is that the external source doesn’t know your child. The reality is neither did the Sen officer writing the notes. Irrespective of who wrote the plan did it do enough to get your child the resources they needed to survive. If it did then great but if it didn’t then that’s when the local authority become the ones you need to speak with over your child’s future. This is a great comment, thanks. My understanding is that collation of the advice, template & parent CYP/views for the EHCP is still done in-house by LA SEN teams. Whether the LA would pass on *all* advice and views received to the outsourcing firm is an open question. Once the EHCP draft has come back from the outsourcer, then the LA team should be checking it. Again, I have no idea whether this final quality control step is happening in practice. The data protection issues are serious. Manageable in principle, but serious. This is something that Ofsted / CQC inspectors should be looking at very closely. I don’t know whether they are. What worries me about this article is how one authority went away from the accepted practice without any apparent risk consideration (lack of consultation gives a clue) and others have followed and appear to be growing. Thankfully the risks are now being discussed and will become more talked about and might stem the rush until a bit more thought has been applied. Your comment is very interesting and in the most part I do agree with the points you are making. The SEND officer will know the town and most likely have interaction with all the professional that are contributing to the plan, therefore I believe there is a greater chance that SEND officer will create a more representational narrative of the child/young person. The approach I believe that my LA will be taking will be to have assessment and review officers gathering the information and then the actual bring together of the document will be outsourced. The concern I have is that a large number of EHCP’s will be produced in a short period of time and the services that then moderate the quality and the parental concerns will be under capacity. All of the comments and reply’s are really insightful and educating. Great post. My first concern is over the money being spent on this – was this what the reforms grant was intended for?! I think not… Unusually, I do feel party sorry for the LAs who have been given this task of completing so many plans in a short timescale – it it’s impossible, then people need to hold their hands up and say so. Or is it that they are not doing their jobs properly? Would 20 decent quality plans in a certain time frame be better than 50 half-cooked ones? Probably not, to the parents who are wanting everything finalised. My own thoughts are that LAs maybe need to stop fearing parents so much – there are plenty who would probably be happy to write their plans for their own children and then have them checked over – is what we want on the whole our child’s needs met, not some diamond encrusted service and fancy whims?! I definitely think the plans should be written by those who have knowledge of and involvement with the child. If teh plans are so difficult to write, maybe the format needs to be looked at?! I run a very small school for children with autism in Oldham (8 pupils) and all of our EHCs to date have been outsourced. We have raised concerns with the LA about this for the reasons you detail in your blog and these have so far gone unanswered. I have re-written my son’s EHCP. The LA have agreed with needs but not provision and I have just scheduled a tribunal appeal. 3 other parents from our school will also be appealing. I have no idea if my boys EHCP’s are being outsourced or not but I do have a question. Are the EHCP’s edited when they are outsourced to fit the services that are local or are they edited for the childs needs? The second question I have is what procedure and good legal practice to LA’s and the companies that the EHCP’s are outsourced to have that proper paperwork is not only issued in what support a child needs so that it can be added to an EHCP and the guaranties that those that are doing them understand it. 1. How do you know if your EHCP has been outsourced? Do Local Authorities HAVE to tell you this is happening? 2. Would you HAVE to agree to it? And if not, what then? Would the Local Authority HAVE to do it themselves? 3. If the Local Authority HAD to do it themselves, what happens if they do it so badly, it doesn’t even look like it has been written about your child? (this also refers to those that have been outsourced). 4. How much longer can this appalling mess of a failure to identify and support the needs of our children with higher educational support needs go on? …Until they have all been excluded from mainstream schools due to the horrendous lack of funding, such that schools/academies can not afford to meet the first £6,000 of funding support, and therefore declare them ‘unmanageable’ and disruptive, rather than children who can achieve and can learn – if only access to Education (with the necessary support) included them too? Question 5. This relates to the process. ‘The LA sends the EHCP assessment paperwork – PROFESSIONAL REPORTS, the views of the child & parents, and their EHCP template – to an outsourcing company’. I put it to you that the question of ‘who’ writes it (privacy and safety issues aside) is little more than a smokescreen for the real issue. We still have a massive stumbling block at the words ‘PROFESSIONAL REPORTS’ as I discovered in a meeting with the LA last week. I have been jumping up and down for the last 2 years*, trying to get ‘professional reports’ and I can tell you, this is a full time job in itself. Meeting the criteria for referrals into services that have not had contact for several years – since the wholesale closure of cases (eg. speech and language) and subsequently, raising the referral criteria such that – even if your child does meet the thresholds it’s still 6-9 months until you might possibly get seen – and finding that even then, if you can get a report written, it is likely to be written in such a way that it doesn’t actually identify the needs of your child using words which clarify and identify services (which legally it must, but in reality it doesn’t ) – and as such won’t help you get your childs’ needs met. It is the reports that identify the need, which then identify the services required to meet the need. If you can’t get the reports, you won’t get an EHCP worth anyone’s bother producing… So ‘who’ writes the EHCP is in that sense immaterial. *If you are well versed in the Code of Practice, you may ask why I have been doing the jumping up and down. I can confirm that the LA say that where a child is discharged from services (eg. Speech and Language, Occupational Therapy, Educational Psychology etc) it is not considered their role to ask for referrals back into services in order to get reports. If there is no service, there is no report. It is considered to be the role of the SENCO to refer back to services if there is considered to be ‘a need’. For the record, these services are all privatised and run by Virgin Care. To summarise. If your child needs an EHCP – I can see no way that in the current climate they can get one which fulfils the legal requirements within the code of practice, unless YOU HAVE THE MONEY TO PAY for private assessments which WILL say what your child needs in language that is specific and identifies every need and what is required to meet that need. And an Educational Lawyer to ensure that when/if the case goes to court you don’t have to learn chapter and verse of the legalities of it all – simply to get your child’s Educational Needs met.